Brief Description Both parks are designed to allow our visitors to get face to face with all types of animals for interaction opportunities not available at other zoos. Description Spend a day at Living Treasures Moraine! Meet, see and interact with hundreds of animals from around the world including several species of birds, primates, big cats and more! Featured exhibits include a rare white tiger, near extinct barbary lions, monkeys, alligators, baby animals and many more! Camel Rides, Pony Rides, Aviary, Petting Zoo, Snack Bar, Large Gift Shop, Free Parking, Refreshments, Picnic Area, Handicapped accessible. 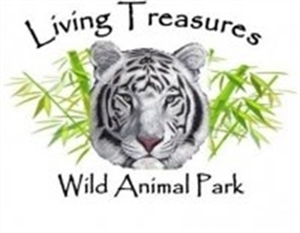 Add Living Treasures Animal Park to your free online travel itinerary.